Growing up we had access to just a few fruit, not as many as we have today. There was always oranges, apples and bananas. We didn’t see anything like kiwis or mangos or anything like that. But that’s okay, it was a nice surprise growing up to be introduced to all those new fruits. 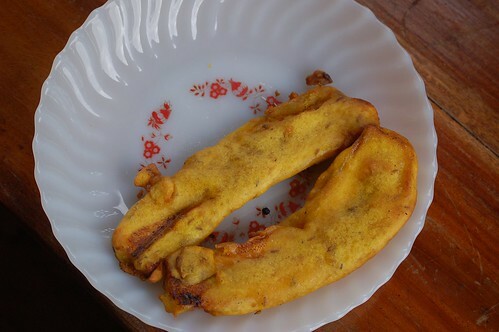 So we did bananas a lot of ways and one of my favorites was the banana fritters. I found this recipe in one of my many many New Orleans cookbooks, which I refer to all the time because it brings back memories of my childhood. I would sprinkle sifted brown sugar or maple syrup over my bananas. Cut bananas in halves, lengthwise; then cut these in half crosswise. Dip in batter and drop, piece by piece, into hot oil. When brown, lift out with wire spoon, sprinkle with confectioner’s sugar, and serve.